IGI software products view and edit a wide variety of data formats, including AutoCAD DXF and DWG data. For a free DXF viewer or free DWG viewer, download our IGI PT Viewer to see how it works. Input is easy for all IGI software products. Just drag and drop DXF or DWG files on the IGI software icon. Import multiple files at one time. You can import and view files with other formats together with DXF and DWG data. IGI Software is powered by RealDWG® Technology. Import hierarchical or flat DXF/DWG data. DXF and DWG data typically import without any adjustments, but IGI’s CAD service experience has led us to expect the unexpected. 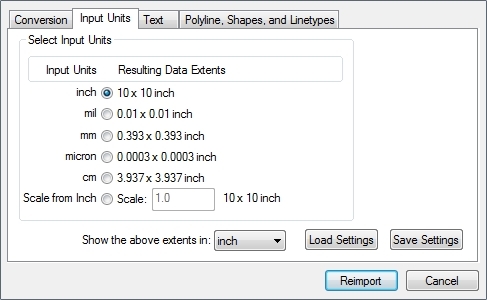 Our Reimport tool lets you refine the conversion of DXF/DWG data with visual feedback. Filter duplicates, empty, unused or frozen layers and blocks from the data. Determine the size and unit settings – before editing. Change how polygon, polyline, circle, rectangle, and text conversions are handled, such as converting circles and rectangles to pads during import. Then click to Reimport, viewing your DXF or DWG data with those settings. When the DXF/DWG data has problem areas, such as self intersecting bow-tie shapes, warnings include links to view that specific area. Once import is complete, take advantage of the powerful array of viewing and editing tools available, that goes beyond zooming and scrolling, to find zero width geometry, smallest geometry, calculate areas and much more. Most viewing/editing features are included with the free DXF / DWG viewer, (IGI PT Viewer), but saving and exporting data are disabled until a license is purchased. Whether your DXF / DWG data is flat or hierarchical, IGI software offers licensed exports with flexible configuration options, using AutoDesk RealDWG® Technology. Select layers to export, specifying layer names and colors. Fracture polygons with holes for easy handling by other devices. Advanced geometry conversion settings for subfigures, polygons, pads, circles, round lines/arcs, square lines, tapered lines/arcs. Hierarchical only: select which object to export. 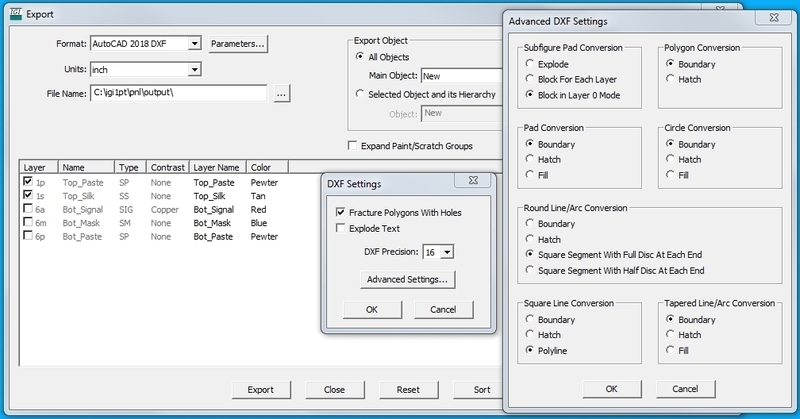 DXF only: set precision for the export, or select a binary DXF format. Export of DXF and DWG data is a licensed option for IGI software. The free DXF / DWG viewer, IGI PT Viewer, can be upgraded with a product license which includes saving and exporting data.